This Anchor Hocking Oneida 81605AHG18 2 quart, liquid measuring cup is made of strong, heat-resistant glass with an integrated handle and pouring spout. It is microwave and oven safe, and is graduated in cups, ounces, and milliliters. Very handy, nice size for measuring. love the nice see through for measuring. My only draw back is that it is on the heavy side when full. I use it for beating egg white to add to a recipe most of the time also. Very happy with this purchase. I love the size of this measuring cup! It is very durable and easy to use. We had a different brand this size that broke and someone replaced it but it doesn't compare to this Anchor Hocking measuring cup! This measuring cup is a great size and sturdy. We have used to melt butter, coconut oil. It has been great for adding ingredients to our batter/dough while still mixing - keeps things from spilling over the edge of mixing bowl. These large glass measuring cups are heavy duty and easy to use for all of my soap making needs. They're clearly marked and very easy to clean. I like the convenience of placing this on my scale, weighing out my soaping oils, adding my lye water to this, then mixing it all up right in the same glass bowl. The large spout makes it easy to pour my cold processed soap directly into the mold. The size is perfect for me since I work in small batches. This will easily hold 2 lbs. of soaping oils. I'm sure these would work great for your cooking needs as well. Very happy with my purchase! This 2 quart glass measuring cup is perfect to use when multiplying any recipe! It’s so much easier to use this glass cup versus a smaller measuring cup multiple times. Love every version of Anchor Hocking's measuring cups. This one is a nice upgrade to its smaller brothers. Perfect for mixing large batches of, say, salsa, granola, dressings, etc. Very durable. Cannot recommend highly enough! A great big beauty of a Batter Bowl who moonlights as a big old measuring cup. This is a great product to have around for the inevitable big batch of something or other that needs to be mixed and then poured and portioned. It's competition is Pyrex's 2 qt bowl not sold on WebstaurantStore but available in plenty other places. The pyrex has a more squared off shape where the Anchor Hocking is taller with more sloped sides. I like having both as the slight difference in shape can come in handy in different situations. This Anchor Hocking definitely pours more cleanly and more precisely than Pyrex's batter bowl. I only wish WebstaurantStore carried the plastic form fitting cover than I believe is made as an accessory for this product. These are sturdy measuring cups. We use them for warming up our oils for making cold process soaps and they hold up well for our needs. This pitcher is gigantic. It's great for making pancakes or waffles. I also like it for stock when i'm making a large batch of risotto. I love that it's microwavable so i can warm milk for yogurt without the risk of it scorching on the stove. I really couldn't ask for more from this glass measuring bowl. It is large, heavy duty, well marked, made in the USA, dishwasher and oven safe, and has a nice handle and spout for pouring. The price is exceptional, at well under ten dollars, too. The Anchor Hocking 2 Qt. Glass Measuring Cup is beautifully made and heavy-weight. It is highly accurate in measuring and dishwasher safe. Highly recommended for commercial or residential use. I love this batter bowl. I can't say enough about it. Super sturdy, I feel like it's unbreakable (um...don't test that though). I don't like those ceramic bowls that look great but make you worry about using them for fear you'll put the down too hard and have them crack on your counter. The markings on the walls are raised, not printed, so they will never come off. This thing is here to last. The walls are high so you can mix vigorously and not worry about making a mess. The capacity is perfect for a cake or batch or cookies or waffles. And it's so much better than a bowl because it has a handle and pouring spout. Everything about it is perfect! There is much to say about this well made, heavy duty measuring cup. I choose it due to the measurements being integrated. I find this cup to be very easy to use and it's sleek yet simplistic design, allows me to store it on the countertop. Be mindful, it becomes quite heavy once filled. I love this bowl so much. I use it to pour homemade broth into freezer containers as well as mix small batches of batter. I love it so much I'm ordering another. This a super handy mixing cup! More like a bowl I say. It is very thick glass and the measurements are in the glass (not printed) so they will never come off. So many uses. I love this bowl! Very useful in the kitchen. We use it for a variety of things. We use it to sometimes carry large amount of water from the faucet to our hot water dispensers, airpots, coffee makers, etc. Very sturdy and well made. This 2 qt measuring "cup" is one of the best items in our kitchen. It is large enough to double as a mixing bowl, which makes it a dream for many jobs, but for us, it is the go-to for pancakes and waffles. This has gone through the dishwasher a gazillion times, and has lasted for years without a single chip. The most clever part about it is the molded, raised markings for measuring as opposed to printed lines (which fade and disappear over time). This guy was made to last, and we thoroughly enjoy it and get tons of use out of it. It is a must-have for any kitchen, and makes a great gift (housewarming, wedding, graduation, etc.). The anchor symbol is on the bottom of each one, to confirm Anchor Hocking's quality. This is a collectible brand, so for what it's worth, your mugs will have collector value if it gets old enough (and if you are ever willing to part with it). I been buying this size measuring cup in another brand, I ran across this while browsing, so got just one. Well I wiil be back, this is much heavier the the ones I have and I prefer the look, wow, some things I find here is just super amazing, great quality glass. Very heavy and strong glass. For a large mixing and measuring bowl this is a great find that is sure to last for a long time. I love this! We use this to mix batters in because of its size! Its also great at measuring large amounts of liquid but I like that it is made with thick glass. It's a great addition to your house or work kitchen! Great multipurpose measuring cup, with a smooth rim, although it is more like a bowl than a cup. Heavyweight glass, Anchor is a quality product. Seems to be resistant to clouding in dishwasher. HUGE measuring cup. Works well for measuring and mixing at the same time. Good and heavy so you don't have to worry about it tipping over when you are moving heavy ingredients around. Microwaveable, pourable and has a handle. Anchor Hocking never lets me down in quality. This batter bowl is perfect for assembling ingredients that may kick up a bit during mixing and keeping everything well combined because it is more deep than wide. love this. I can put my ingredients in this with room to spare. Then I put it in the micro wave to heat or melt them. Works great for mixing pancakes and then using it to pour the batter on the grill. Very durable. Being home users, living in a tiny studio, we were reluctant to order the mandatory 4. However, we couldn't be happier. We are using them every day, more than we thought. The size is perfect for mixing dough, salads, washing food items, mixing drinks, and even fits in our refrigerator for easy storage. This measuring pitcher is amazing quality for the price. In fact, it's a little on the heavy side (my wife uses two hands). It is the perfect size for mixing liquids and the volume seems pretty accurate. what i like about this 2 quart glass measuring cup is that the measurements are imbedded into the glass. They wont rub off or fade away. They priced it very well. The Anchor hocking 81605E 2 Quart Glass measuring Cup. It is great. I love mine, I have 2 . I love mixing my batters in it with te pour spout it comes out easy. It is microwave safe as well as oven safe. You can't beat the price. The Anchor Hocking 81605E 2 Quart glass measuring cup. It is great, i use it for more than for a measuring cup. I also mix cookie batter and ect. in it. it is my favorite bowl. This is a super useful bowl/measuring cup. I mix all sorts of batters in it like everyone else, but I also use it as a water pitcher when making soup or stock. Instead of carrying a heavy loaded pot to the sink, I can just carry this with water to the stove. As much as I use this, I'd give it more than 5 stars. _Highly_ recommended. 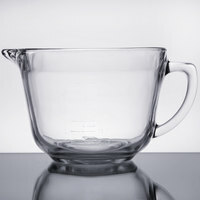 The Anchor Hocking 81605E 2 Quart Glass Measuring Cup it is great. i use this measuring cup for mixing up cakes, pies, ect. With the pour spout at the top works great and is microwaveable. these Anchor Hocking measuring cups are very well made and will last you a lifetime. I not only measure with these, I also mix. so i have both. This Anchor Hocking 2 qt is a great measuring cup. You will use this for more then measuring though. I use it for everything. Great Buy. When you purchase this measuring cup, you wont just use it for that. it makes a great mixing bowl for just about anything. very well made! i just had to take one home. We are using these measuring cups for measuring and mixing salad dressings and other things. We have some of these at home and they hold up well and the price is right. I admit that I purchased this just because I had always wanted a giant measuring cup. But I have used this cup daily. It's the perfect size to cool the dough slightly and mix in eggs for pate a choux. And while I don't make cream puffs everyday, I do use this cup everyday to brew tea for iced tea. I am very happy with this purchase. This product has become a life saver in the kitchen. We have found we use it more than we originally thought we would. It makes prep time easier. This is the best mixing/ measuring/pouring bowl. It's easy to use,has a nice feel, handles well, sturdy. It is big enough to mix a cake mix in.I absolutely love this product, and I am looking for more for gifts. It is not easy to find this size in stores. So, snap it up when you get the chance!